During the 75 years before the great 1906 earthquake on the San Andreas fault, the San Francisco Bay area suffered at least 14 M>=6 shocks on all major faults, including two M>=6.8 events; during the succeeding 75 years, there was but one M>=6 shock The San Andreas fault is dotted, and interpreted rupture scenarios are shown; urban areas are gray. Although this is the longest historical earthquake record in the western U.S., it is likely complete for M>=6 only since the Gold Rush (1849), and so underestimates the rate of shocks during the pre-1906 period. The southern end of the 1906 rupture lies near the bottom of the image; the northern end lies 200 km northwest of the image. 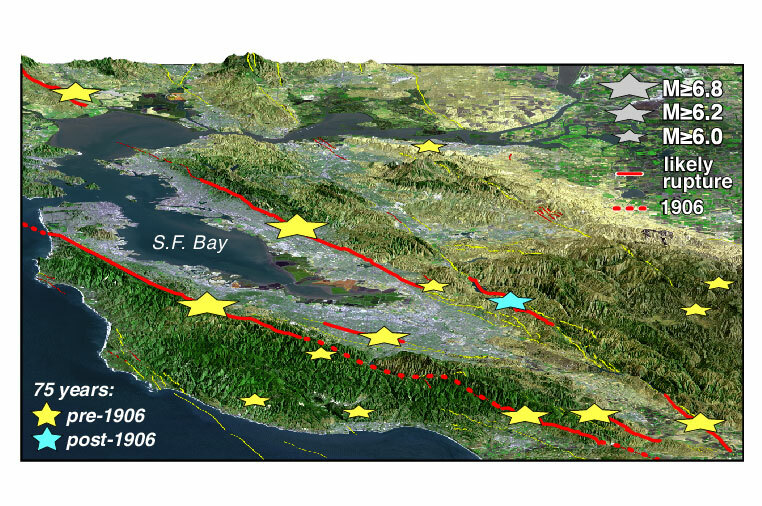 Figure from Stein, R. S. The role of stress transfer in earthquake occurrence. Nature 402, 605-609 (1999). Bakun, W. H. Seismic activity of the San Francisco Bay region. Bull. Seism. Soc. Amer. 89, 764-784 (1999).